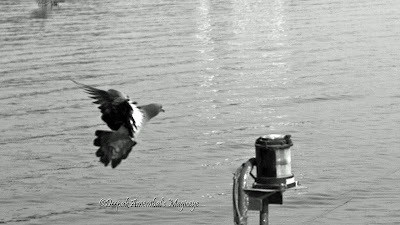 Camera critters taking flight at Sewri, Mumbai. Spotted this beauty at the Sanjay Gandhi National Park in Mumbai. 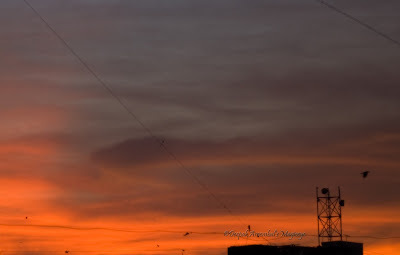 The Mumbai sky as seen on 13Jan10 at 6:37pm. Messy traffic conditions on and under the flyover outside Dadar Railway Station. For full impact click on pic. Birds at the Sewri mudflats, Mumbai. 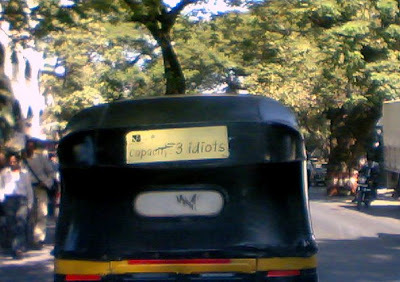 The sticker on the autorickshaw reads - Capacity:3 idiots ! Today is our 60th Republic Day and will be celebrated with a display of our armed forces parading along with floats depicting our culture from various states. 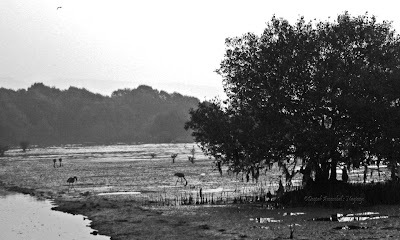 A monochromatic view of the Sewri mudflats in Mumbai. 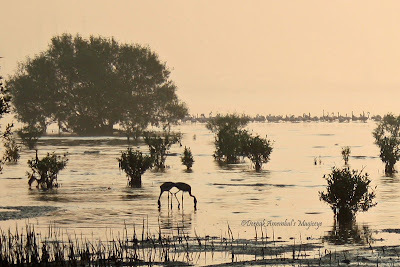 Pair of Flamingos feeding in tandem at Sewri mudflats in Mumbai. Balanced! 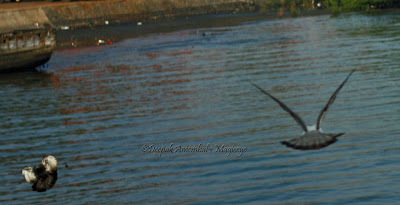 A bird showing off its superiority at Sewri, Mumbai. 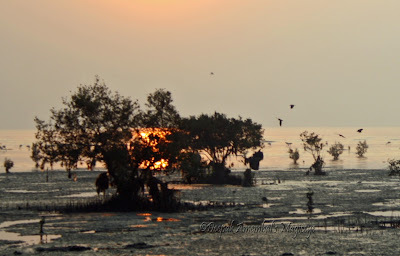 Golden dawn at Sewri, Mumbai. A for Airborne! 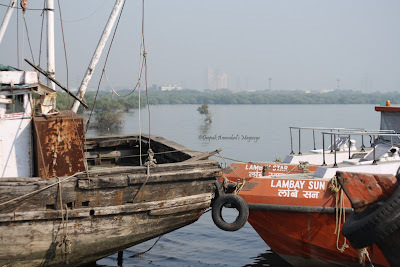 This image was captured at Sewri, Mumbai. 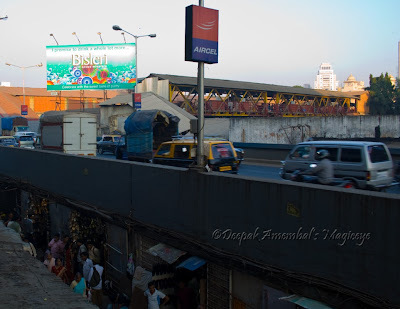 The Dadar flyover. 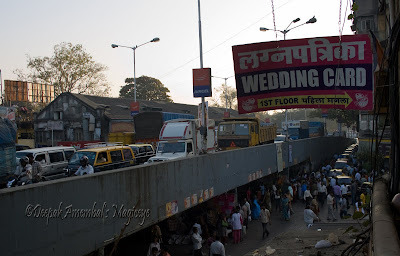 On the other side is the Dadar Railway station. It is a major Railway junction hence a major market place for vegetables fruits and flowers and more.. Under the flyover there are shops too doing brisk business. Next week I will show the other end of the flyover. 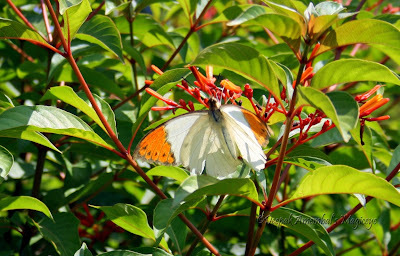 A nectar addict sipping it up at the Sanjay Gandhi National Park in Mumbai. 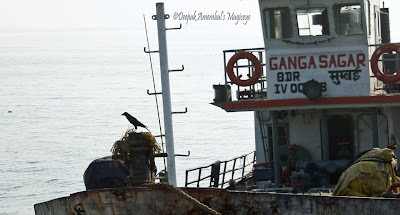 A crow resting on a jiggly boat at Sewri, Mumbai. 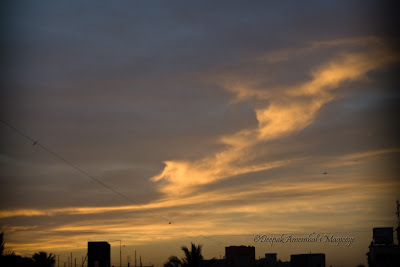 The Mumbai sky as seen on 13Jan10 at 1821hrs. Today is Makar Sankranti - after this day the days start becoming longer and warmer and thus the chill of winter declines. The festival therefore takes place around 21 days after the tropical winter solstice (between December 20 and 23rd) that marks the starting of Uttarayana, which means northward journey of Sun. 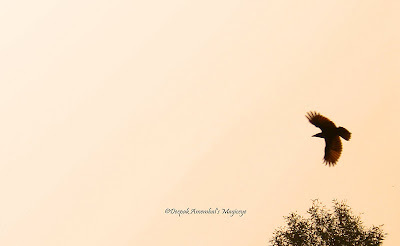 Sankranthi means transmigration of Sun from one Rāshi (zodiac in Indian astrology) to the other. Makara Sankaranti, or the transition of the Sun from Dhanu rashi (Sagittarius) to Makara rashi (Capricorn). Sankranti is celebrated all over South Asia with some regional variations. 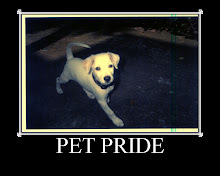 In India, it is known by different names and celebrated with different customs in different parts of the country. Since the festival is celebrated in mid winter, food prepared for this festival is such that it keeps the body warm and gives high energy. 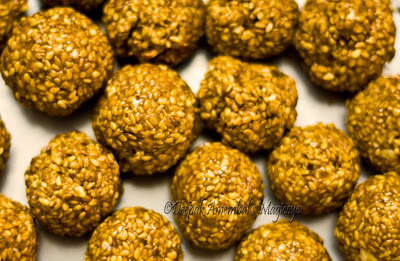 Laddu of til made with Jaggery is a specialty of the festival. In the western Indian state of Maharashtra it is called 'Tilgul'. These Til(sesame seeds)gud(jaggery) laddus(balls) are distributed while saying 'Tilgul ghya ani goad goad bola' meaning 'Take this Tilgul and say sweet things'. Pictured above are the Tilgul laddus and I offer it to all saying 'Tilgul ghya ani goad goad bola'! Zoond or Zund in Marathi (state language of Maharashtra of which Mumbai is the capital) means a group/flock/herd or collection. 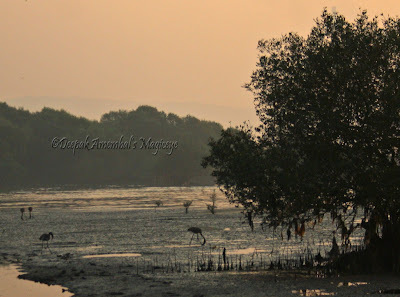 so have pictured a Zoond of flamingos relaxing in Sewri, Mumbai. The guy sitting cross legged is reading holy scriptures and the family alongside has come to do some flamingo watching and picnicking at Sewri. All part of my beautiful world in Mumbai! Driven up the wall on the roof! 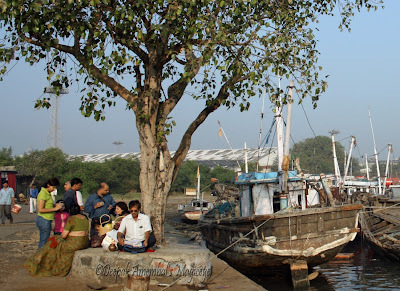 Old companions at Sewri creek in Mumbai. The Mumbai sky as seen on 19dec09 at 1745hrs. A dark flamingo feeding at the Sewri mudflats in Mumbai. Yellow balloons strung across for decorating 'Ribbons and Balloons' - my favorite cake shop in Mumbai. The New Year message from Khar in Mumbai - Stop Global Warming! Ribbons and Balloons - a cake and pastry shop in Santacruz (West). 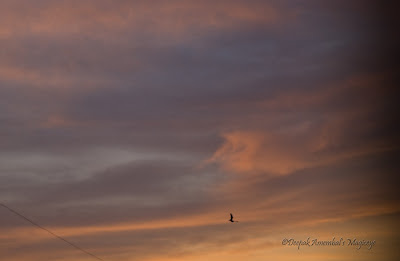 The Mumbai sky as seen on 19dec09 at 1737hrs.
! !WISH YOU AND YOURS A SUPER DUPER 2010! !